In the realm of ultra-exotic luxury cars, picking colors and trims from a catalog just isn't special enough for some customers. Hence why companies like Bentley constantly reveal new special editions such as the Bentayga by Mulliner and the Pearl of the Gulf Edition. The UK automaker has just revealed a new special edition called the Bentayga V8 Design Series, which - you guessed it - is now available on V8-powered Bentayga models. The Design Series combines exterior and interior features from Mulliner with a suite of existing Bentayga options to create a bespoke look. 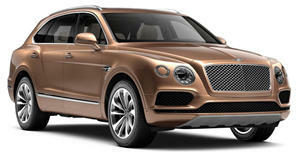 Bentley says this new limited edition emphasizes the Bentayga's "elegantly sculpted and athletic stance, reflecting supreme levels of luxury and performance." On the exterior, the Design Series features Mulliner touches such as Palladium Grey Paragon aluminum wheels with self-leveling wheel badges, as you'd find on a Rolls-Royce. Other unique touches include a colored lower front bumper and twin gloss black tailpipes. Design Series badges on the lower front doors are a subtle reminder to onlookers that your Bentayga is more special than a run-of-the-mill one. Inside, a color-themed cabin is paired with a new carbon fiber weave and duotone color palette. Bentley has shown an interior with black leather and red accents but we assume other colors are available to match the other exterior paints. There's also a Breitling clock with a mother of pearl face. Bentley continues to hit home runs producing the prettiest carbon fiber weave patterns, this one using an intricate diamond quilted design. Other surfaces are finished in Piano Black to complement the dark interior. As with all V8 Bentayga models, under the hood sits a 4.0-liter twin-turbo V8 producing 542 horsepower and 568 lb-ft of torque, enabling a 0-60 mph run of 4.4 seconds. Bentley didn't reveal pricing or production numbers for the Design Series but we expect it to cost a bit more than a base V8 Bentayga at $165,000.